“Be yourself!” “Think outside of the box.” “Don’t just follow the crowd.” Such phrases pervade our culture, encouraging us to value individuality and creativity, and to resist conformity. However, recent research in social psychology has shown that in practice, we are averse to and at times, even hostile to people who ‘stick out’ from crowds, reject the status quo, and do something new. The fascination with individuality and creativity is not new, of course, and these traits were of great interest to nineteenth century thinkers such as John Stuart Mill and Friedrich Nietzsche. However, unlike today’s psychologists, they attributed the absence of individuality and creativity to modern democracy. This talk focuses on Mill’s concern, connections to Nietzsche’s thought will also be made, that democratic society corrupts individuality, how he sees conformity as a problem and individuality as an important part of the life well-lived and how he thinks that democracy is unique as a regime type in discouraging individuality and encouraging conformity. Jennie Ikuta is the IE-Brown International Teaching Fellow for 2014-2015. She received her BA from the University of Chicago (2007) and her PhD from Brown University (2014). 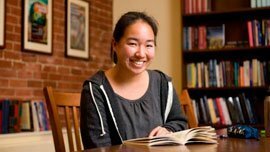 She is currently at work on her book manuscript based on her dissertation, titled Democracy and the Quest for Human Flourishing: A Study of Mill and Nietzsche.